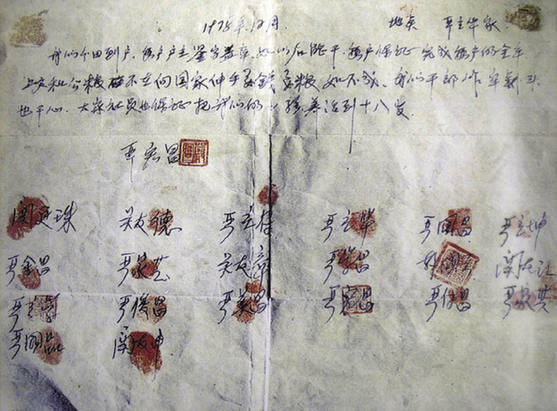 For an ordinary Chinese, this document is greater than the Constitution of U.S.A. Yes, indeed. That may be a very valuable piece of paper. I wonder if it's possible to buy it, if so how much, and whether the authorities would allow it to leave the country. I don't understand. You acknowledged the value of this paper to the Chinese people... and then you immediately thought about taking it away from them. What sort of thought process comes up with that? If the people value what money can buy (houses, education, health care) more than a piece of paper, who are YOU to tell them that they can't make a trade like that? The irony here is that you're endorsing a statement about freedom, trade, and property...and then saying that a PIECE OF PAPER is more important than freedom, trade, and property. Since in India, plenty of farmers owned what they grew, decades before China, the untold part of the story is all that the government did or did not do to spread literacy, roads, etc, etc. Also 30-50 million people did not starve in India in the 1950s and 1960s as happened in China. Yes the strange and disquieting fact that though Indian independence happened in the middle of a famine, no famine has happened since in democratic India. You might start to think that democracies are the one type of state that seems to object to the people starving to death. OTOH over most part of the last 50 years India has been substantially more democratic and free market than China. Why India has yet lagged China in almost all metrics of socioeconomic well being is a puzzling question. Say, 70 years ago did China already have a headstart on metrics? Or is it reaping some spillover incidental benefits (discipline, lack of protest, one child policy, strong central control etc. ) of the obviously evil Communist rule? India and China are totally different countries. China has been China for thousands of years, there's been periods of civil war and fragmentation but it's clearly one of the most cohesive civilizations. India on the other had is basically a newly created entity and was never really unified before 1947. Even under the British Raj India was divided into semi-autonomous principalities who were essentially vassals of Britain. Some of these, like Hyderabad, invested in education and infrastructure and are hence today some of the wealthier regions of the country. India's democratic set-up certainly let it avoid the millions-of-deaths famines. China did not have a head start on metrics either. But China made sure its people were literate. (e.g., Jean Dreze, Jackie Loh, Literacy in India and China, Economic and Political Weekly, November 11,1995). BTW, it is widely reported that literacy, roads and agricultural research are the three most effective investments to reducing poverty in a country like India. CBBB is wrong - though there were some 560 princely states, the vast majority of India was under British rule (and not semi-autonomous). Even if we count only modern political arrangements, India has been united since 1857 or earlier. Lastly, there is no linkage between "political cohesiveness" and economic growth. Anyway, the real point is that I'll bet that Cowen and Tabarrok's does not touch upon the role of government in providing the necessary "background" for market incentives to have value. I certainly do not see it in the table of contents. And thus, it is imbalanced, and is possibly teaching students an incomplete truth. You would lose your bet. Tyler and Alex's Modern Principles discusses public goods, political stability, honest government and even how democracy prevented starvation in India. Amartya Sen, the world’s leading poverty scholar and Nobel Laureate in economics, gave a direct comparison between famine in China and famine in India. “India seems to manage to fill its cupboard with more skeletons every eight years than China put there in its years of shame1958-1961″ (Dreze and Sen). China’s years of shame 1958-1961 referring to of course the great leap forward. Today as we speak about a million Indian child died of malnutrition every year according to UNICEF. And that 30 million people figure so often touted, is sourced to a very 'neutral' source "Le Livre noir du communisme" where they calculated that number using actual population growth versus expected exponential population growth. This counts everyone that dies of disease, lower birthrates and every baby that was not born as people killed by famine, without actually relying on any research. I'm guessing this is racist, but I haven't figured out how yet. Over here, in Massachusetts, the Pilgrims tried communal agriculture too. For one year. Half of them starved to death. Not having a dictator calling the shots, they gave it up the next year. Though it could, I suppose, still be racist even if it applies across races. What "revolutionized" China was their amazingly good luck at getting a non-insane dictator on only their second draw from the urn. What "revolutionized" China was Econ 101, not some "secret" agreement. So you think that if these and other farmers hadn't reject collectivism, it all would've just happened anyway? Historical forces arise from individual acts. Yea that must be it. Chinese people from the fall of the Qing to the rise of Deng were just too lazy and stupid to modernize themselves. But then the late 1970s roll around and boom, off they go re-inventing property rights. Isn't there a corresponding yarn about The Pilgrim Dads? That sounds like free-market fundamentalism and that is what has gotten us into this mess. The way forward now is to try bigger government stimulus packages. Brilliant. Yes, those far right market fundamentalists at NPR again. What "has gotten us into this mess" was abandoning the collectivist Maoism that killed 50 million people. I'm used to hearing fools recite 40 year old pidgin Keynesian gleaned from Krugman's political hackery, but this takes the prize. But the rapid economic growth in China is depends on the violation of property rights on a large scale, and the defense of property rights in the US is attacked as obstructing economic growth and job creation. In China, a big economic project that requires land gets rapid support from local political leaders who work quickly to take the property from individuals so the factory or whatever can be built quickly. In the USA, when property owners object to oil pipelines being run across their land and actively defend their property, we have politicians and businesses and even foreign governments protesting and demanding the US government act quickly to take away the property rights. Why Congress recently demanded Obama give quick approval of a pipeline even though property owners and a State government objected to it and had forced the foreign corporation to commit to a new yet to be determined route. Of course, even Obama's approval would not be the end of the obstruction by property owners - they would have filed lawsuits, even though Kelo established after a decade of asserting property rights that the government can by due process take land for private profit, but due process can takes years if not decades. I find the defense of property rights to be selective by those who claim property rights are the ultimate answer to liberty and economic prosperity - only when their property rights are protected at the expense of the property rights of others are they fully behind property rights, but when the property rights of others block their way to profits or employment, well, the government needs to step in and stomp on those property rights of those blocking the way. The EIS - environmental impact statement - was created by Nixon to make sure everyone's property rights are considered and balanced, with the EPA created by Nixon to administer it, yet that the the institution conservatives seem to universally object to because they find all sorts of cases where the property rights of the many limit the actions of a limited number of property owners. Oh yeah, without those conservatives in the majority on the Kelo decision, the state would not be able to trample on property rights. Also check out the work conservatives & libertarians who are trying to blight property to expand Columbia U or tear down a non-profit boxing gym to make way for developers who are connected. Once upon a time China did not recognize any property rights at all. The fact that they now violate them is, in its way, a sign of progress. In China you can't "own" property. At most you have a long term lease to use a given parcel because the land itself technically belongs to "the people". Nonetheless, that lease grants you certain rights. China is hardly a model of property rights, but it's undeniable improved from the days of Mao. You can't own property in the U.S. either. Try and see what happens if you don't pay your property tax for a few years. I'd like to get a poster of this document and put it up in my office. Anyone know a source for the image? I have a friend who is a graphic designer and can help me with the rest. Talk about cherry picking! As Angus points out, ignoring the effects of the removal of Mao from the scene is academic incompetence. Having everyone dress the same and thin the same might have a stifling affect on culture that has little to do with individual property rights. One small irony here is that the fierce individualists who applaud this as a Chinese Magna Carta skip over the collectivist safety net that made it work: the guarantee that your children would be cared for if anything happened to you. How is a multilateral informed voluntary mutual agreement with free and full marginal exit/entry and excludability, "collectivist"? What, you mean "collectivist", like a corporation? Dude, Mao's death is explicitly noted as key. The guarantee of your children's safety?! Have you not heard of the Cultural Revolution? My Chinese ex-wife lost family members during the Cultural Revolution. Not to mention that a lot of people 15-30 wasted years on a collectivist farm instead of going to college. Property rights are very important unless you're a native American, say an 1885 Mandan along the Missouri River in North Dakota or a Comanche in western Texas. Then your properties rights are sold by guys like Napoleon or Czar Alexander to other guys like Jefferson or Lincoln, who either swindle you out of your land with pittance payments or simply kill you if you don't go along with the program. Of course the folks now living on the land that once belonged to the families of Quanah Parker and his contemporaries think they actually own the land they park their pick-ups upon but if they fail to pay their taxes or erect a silo without a building permit they soon learn who really owns the property. Interesting! So it's not just property rights, but what you intend (or don't intend, in the cases you cite) to do with them? Incorrect. Native Americans in these areas had no individual property rights. "Farther from the rivers, however, where the value of land for crops was low, it was not worth establishing ownership. " Of course they had individual property rights, in terms of personal possessions. They also had, as the text to which you linked, rights of use to property that had been handed down through generations. The point being made is that whatever rights the native Americans felt that they had, which may have been different from one group to another, the white Americans from the East had no intention of honoring those rights, except on their own terms and ultimately by force. It may be apocryphal but it's said that after signing an agreement with the US for the purchase of an extensive area of land, Sauk chief Keokuk was asked by a newspaper reporter how he could give away the home of his people for a relative pittance. His reply was that the federal government didn't realize that he had no authority to do such a thing. If collective property all the way down without any private property is the worst, then clearly private property all the way down without any collective property is the best. It's simple logic*! 18 households in one village... What a tiny sample, even for an example. Moreover, these people choose to join the free property (ie not a randomized experience). BTW, I'm conviced free property is better but I don't like this kind of anecdotal evidence to support it. I'm sure we can find examples of tny experiments of collective property that worked very well. Based on this example Cuba is now privatizing it's farms.